If you have been injured by the beautiful game - read our guide to find out more about making a football injury claim. Sport has always received a significant amount of protection from the law in order to take into account the physical nature of games. It is expected that, during a game of football, players will receive and dispense more physical contact than would be permitted in normal society and knocks are expected. However, when serious injury is caused either intentionally or recklessly, the law considers it beyond the normal parameters of the game. Depending upon the circumstances an injured player may be able to make a personal injury compensation claim . If you wish advice on making a claim call 01252354412 . Few personal Injury actions between professional footballers as a result of injuries received on the playing field go through the full court process. This is because every professional football club is required to carry indemnity insurance, meaning that insurers are most likely to settle any claim if the club could be liable. Because the issue rarely becomes before the courts, it is difficult to know what the exact standard of care footballers owe each other. However, by applying the general principles of negligence, it is possible to consider how the courts might approach a football injuries claim. How are footballers required to act when playing against one another? In order for a claim for personal injury to be brought there must be proof of a negligent act by one party (claimant) where they owed a duty of care to the other (defendant). The defendant will have breached that duty of care when their conduct falls below the standard of conduct generally expected of a person in their position and where this breach has caused reasonably foreseeable harm to the claimant. This general legal definition also applies to sports injury cases. Therefore, every player is judged by the standard of the 'reasonable footballer' to ensure a minimum degree of skill is attained and maintained by all those playing. Where sport is concerned, each league, or possibly each tournament, is a closed system and the standard of this care changes depending on the circumstances. This does not create a variable standard, but simply evaluates whether a reasonable person of the same level of skill, training or qualification would have done the same in those circumstances. As well as judging the level at which the injury occurred, the court is to take into account all relevant circumstances when evaluating the 'reasonable player'. Football is a contact sport but players must only make physical contact with opponents within the parameters of the game. Case law has provided a standard of care required of sportspersons in order to bring a claim for an injury under negligence. The examination of the reasonableness of a person's acts will be taken into account, for example, was there malice when the player made a late tackle with their studs showing? It should be noted that, because of the inherent danger of the sport, something more than an error of judgement must be required to establish a claim for negligence. For help at this stage please call 01252354412 or fill out the enquiry form . 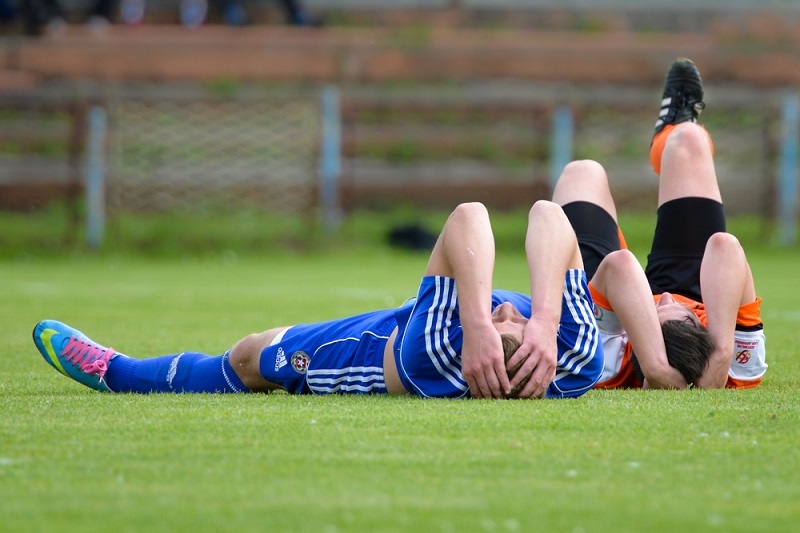 Is my football club liable for my injury? An employer or club is liable for the negligent actions of an employee or player who causes serious injury to another whilst they are acting in the course of their employment. This is known as 'vicarious liability' and allows a player to claim for personal injury because the harm was done during the playing of the game and, therefore, in the course of the second player's employment. This could include in-match fighting but does not extend to acts beyond the duration of a match. When is my injury not the players fault? If a player has consented to the injury-causing contact then the other player has a complete defence against a claim for damages, for example, when the injured player instigates a fight or hurts themselves in a tackle. Where the injured party consciously ran the risk of the other player acting negligently , the defendant will be able to raise a defence that they did so knowing the risks. Such a defence will be examined alongside an evaluation of whether the defendant has breached their duty of care to the other player. Get help today , call 01252354412 or fill out the enquiry form . The level of damages awarded varies depending on the level at which the sport is being played at. At the elite level, particularly in the Premier League in England, damages are likely to be significant. It follows that for an aspiring young professional footballer, with significant , a career-ending tackle or one that creates long-term chronic injury might demand damages greater than pay-outs from instance schemes provided at smaller clubs. Importantly, in football related injury cases the pay-out (or 'quantum') of damages for loss may also consider prospective earnings. It is most common for insurance schemes to adopt a flexible and individualised approach to assessing damages and negotiate between them. Courts are less likely to make an evaluation of quantum; however, they adopt the same approach and use pre-established guidelines to sup-plement the facts when making a sports-injury related award for damages.